It's estimated 82% of adults are regular coffee drinks, but on hot summer days is drinking a mug of coffee really the best refreshing drink? I don't know about you, but I really go off tea and coffee during the warmer months but sometimes I just crave that delicious coffee taste. That's where cold brew comes in to save the day! Unsweetened Black & While Cold Brew made with almond milk - it's 100% GMO free, free from gluten, suitable for vegans and soy free too. This cold brew is a dream enjoyed just by itself, but I love blending it into smoothies to create a refreshing, cooling, summer coffee drink. My go-to recipe is a coffee & coconut blend, and lucky you....I'm sharing the recipe in this blog post! 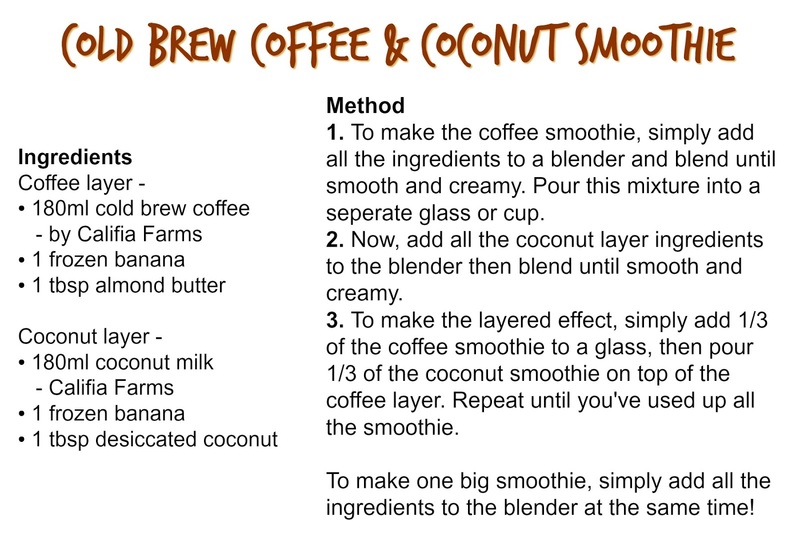 This Coffee & Coconut layered smoothie tastes so indulgent (almost like a dessert!) but it's also loaded with goodness, only contains natural ingredients, there's no added refined sugars and it looks pretty too! If you want, you don't have to create two smoothies and layer them but simply add all the ingredients in one go - I just like the contrasting colours and it makes it super fun to drink. 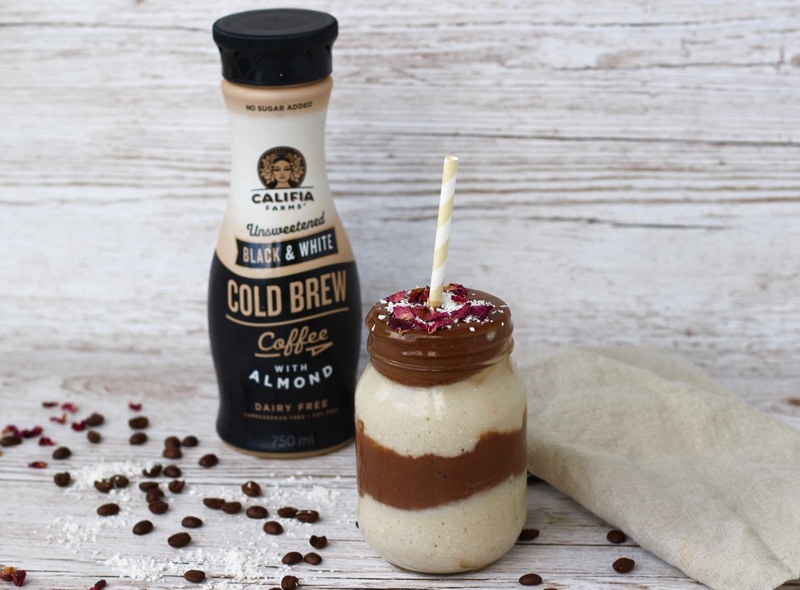 The cold brew coffee layers are made with frozen banana, almond butter and the Califia Farms cold brew coffee - delicious, rich and super flavoursome! The coconut layers are made using frozen banana, desiccated coconut and Califia Farms coconut milk which I love as it has no added sweeteners or artificial ingredients (plus it tastes so creamy!). Both these Califia Farms products are available in Sainsbury's stores nationwide, as well as some of their other products including their vanilla almond milk which I'm obsessed with!